An exciting new dinner series featuring handcrafted goods, live music, and a fine, outdoor dining experience with a popular local chef! CHECK BACK SOON FOR OUR SPRING 2019 SUPPER CLUB DETAILS! The Handmade Supper Club is an exclusive event of fine outdoor dining featuring a popular local chef, an amazing jazz vocalist from Texas, and a cherished, custom made place setting from area makers that each attendee will get to take home with them at the end of the evening. The Little Craft Show will be hosting the first of this dinner series on Saturday, September 22 from 5-8pm on the gorgeous grounds of Magnolia Gardens in Springdale, Arkansas. Our featured chef for the evening will be the popular Chef Case Dighero of Edible Culture. Jazz vocalist and composer Isabel Crespo will be joining us for the evening from Denton, Texas to serenade the crowd with her poetic lyrics and unforgettable voice. Guests can expect a sultry, September dinner under string lights surrounded by a canopy of 100 year old trees. Each place setting will have a custom made, hand turned wooden plate, a wheel-thrown and hand glazed ceramic tumbler, a hand poured soy candle, and an indigo-dyed linen napkin. Each guest will take home all of these handcrafted treasures at the end of the night! Join us for the first Handmade Supper Club to honor our artisan community and celebrate a culinary experience with friends in the most gorgeous setting! This dining experience has been carefully crafted for an exceptional night out. Chef Case Dighero has crafted an exceptional menu for your dining pleasure! Isabel Crespo is a United States-born Costa Rican-Ecuadorian jazz vocalist, composer, arranger, and educator currently living in Denton, TX. She spends her time performing, leading ensembles of varying genres and sizes, teaching, and collaborating with artists both nationally and internationally. She is praised for her ability to utilize her voice with expressiveness, as well as with the agility and precision of an instrumentalist. 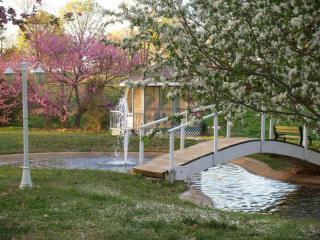 Magnolia Gardens is one of Downtown Springdale’s best kept secrets. Formally a private event venue catering primarily to weddings, this stunning piece of land boasts some of the oldest and largest variety of trees in downtown with the city’s namesake creek, Spring Creek, running along the border of the property just yards from the Supper Club dinner tables creating a serene country setting right in the heart of the city. With an extra large gazebo, a small pond with a water fountain, and the Razorback Greenway trail just yards away, this incredible venue will not disappoint. In the event of rain, Magnolia Gardens has an equally stunning indoor facility wrapped in tall glass windows that will comfortably hold us for the evening without compromising your experience. Tickets are limited to 100 guests. Register below to reserve your place at the table! Please note that no refunds will be given for this event unless it is cancelled by The Little Craft Show.